Shortwave radios have been around for a long time but even today they hold the same sway over radio enthusiasts that they used to decades ago. Reason; they are the simplest and most effective means of communication across local towns, countries, even continents. 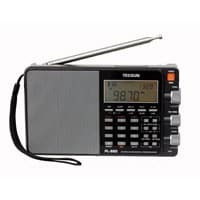 You can listen to national and international broadcasts, AM/FM radio, connect with others even in remote locations, participate in ham radio communities and even pick up emergency broadcasts. It is amazing how you can achieve so much from just one device. Over the years, so many models of shortwave radios have made their way into the market that finding the best shortwave radio that fits your requirements can be a real challenge. With different abilities, features, and price bands, how do you know which radio will make for a great purchase? In this article, we'll discuss what we believe to be the top five shortwave radios in the market today and also provide our recommendation for the best shortwave radio out of the five, based on the overall value-for-money quotient of the product. In this section, we’ll review what we consider to be the top 5 shortwave radios in the market today owing to their size, looks, features, and respective shortcomings as well. All these are great radios in their own right but score over one another in different areas. Let’s review. Kaito has brought out some amazing radio offerings in the past and this one is no exception. Kaito KA500GRN is a good-looking rough and tough radio device that can act both as a regular shortwave radio as well as an emergency radio. It has unconventional looks and a durable build quality due to the use of ABS material. It comes with a plethora of unique features like 180-degree solar panel, telescopic antenna, LED reading lamp and flashlight, and impact and water resistance. You can also power it with a hand crank. The biggest selling point of the Kaito KA500GRN is the ability to quickly connect to emergency services if you are stuck in hostile conditions. Since it has its own solar power supply, you won’t get stuck even if you do not have spare batteries or a power outlet. If you are stuck in the dark, use the LED reading lamp to read or the LED flashlight to find your way. Whether you want a radio for regular home use or need one for use in emergency situations, Kaito KA500GRN fits the bill perfectly. The Tecsun PL880 was considered one of the most innovative devices at the time of its launch. The biggest strength of this radio is its control panel that has a very tactical and smooth response. The buttons feel sturdy and the overall build quality is very good. For your money, you get most, if not all of the features and functions a modern shortwave radio should have; a three-position well-appointed antenna, a headphone jack, a line-out jack, and an external jack to the left. There is a good looking central knob to tune the radio, a volume control, and a backlight switch. On the whole, it is a full-featured good looking device. The best feature of the Tecsun PL880 radio is its sound quality which is crisp, loud, and crystal clear. This despite the fact that the radio doesn’t have a bass (a feature limited mostly to large radios). The Tecsun PL880 is a perfect combination of looks, features, and performance. When the signal of a weak DX station drops below a certain level, the radio automatically goes into a muting mode and then pops back up which makes it really annoying to listen to. C Crane CC Skywave is one of the most compact and at the same time durable modern radios in the market. It is well-built, fits in the smallest of backpacks, and is known for its longevity. The LCD has an LED backlight and even though the screen itself is small, it has good viewing angles. The buttons are well-placed ergonomically and have a nice feel to them. They also feel durable and built to last. However, we feel that they may require some hard pushing to operate after a few years. It comes with five bands and has a built-in station allocation feature. When you find a station, just hold on to it for two seconds and it is done. The radio is quite beginner-friendly but there are certain features that may need referencing a manual even for intermediate or expert users. The Tecsun PL-380 is the smallest of the units that we are reviewing in this article. It is an ultra-portable unit and is so small that it easily fits in the pocket of your shirt or trousers. However, don’t mistake its small size for the lack of features. The Tecsun PL-380 packs quite a punch with feel-good tactical buttons, a reasonably good display with yellow backlight, a lock button to activate/deactivate all the controls, and a three-stage antenna that works well with all the signals. The sound quality isn’t very loud which is expected at this price point but it is not a deal-breaker. 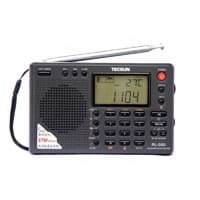 If you travel frequently and size is a huge consideration when buying a shortwave radio, the Tecsun PL-380 will delight you both with its low size as well as price. The Eton Executive Traveler is an affordable shortwave radio that receives long wave, AM, FM and shortwave bands. The FM band in this radio supports RDS data display. Speaking of the display itself, it is large and perfectly readable. You can set the brightness to off, low, or high and from all the angles, the view is good. With the needs of a frequent traveler in mind, the Eton Executive Traveler allows you to set the local as well as world time, has an alarm clock, sleep timer, and even a snooze light. It also displays the temperature so that you can prepare yourself accordingly in any part of the world. The tuning knob is situated below the display is a little awkward to use. 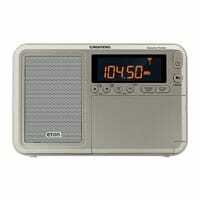 With 500 memory presets, the Eton Executive Traveler is a nice radio if you travel frequently. Buying a shortwave radio can become confusing and cumbersome considering there are a variety of shortwave radios with different sizes, cost, features, complexities, and so on. As a result, there is no one-size-that-fits-all. You must determine your requirements and then decide which one will work the best for your needs. However, there are a few common factors across all models that you should pay attention to when buying a shortwave radio. Shortwave radios come in varying sizes; large table-tops, compact portables, and small ultra-portable radios. Table top radios: The table top radios are huge in size and are installed in homes at one place, usually with add-on accessories like power adapters and speakers. Due to their size, the power requirements are high but at the same time, they offer higher range of signals as well. Of course, if your idea of a shortwave radio is taking it everywhere you go, table-tops are not for you. Portable radios: These radios are small in size and can be taken anywhere. Portable shortwave radios are the most commonly bought radio types. They are very good at catching the shortwave broadcasts and prove to be great entertainment companions in trips due to their portability factor. Ultra-Portable Radios: Finally, the ultra-portable radios are the kind that are very small (they can easily fit in your pocket) and serve as entry-level shortwave radios with minimal features. If you are just starting with shortwave radios and do not wish to spend a lot on a shortwave radio, ultra-portable radios make for a sensible purchase. They do have all the basic features and are a good starting point in your journey towards exploring shortwave radios. However, they are severely limited in their ability to pick up weaker signals. This is a critical consideration. Every radio comes with its unique ability to receive different frequency bands. A band is a range of different frequencies. Some of the different band allocations are the AM Band, FM Band, Long wave Band, Amateur Radio, and so on. When you decide to buy a radio, ensure that the radio supports the band you would like to listen to. You should also make sure that the minimum shortwave frequency that a radio can pick up ranges from 540 kHz to 30 MHz. Most modern shortwave radios come with a digital display that shows the frequency the radio is tuned to. This is an important requirement since it can get extremely difficult and frustrating to find a radio station without the frequencies being displayed on the screen. There are some inexpensive units that come with an analog readout that indicates an approximate range of frequency the radio is receiving, but we do not recommend them. Some units come with built-in antennas whereas there are others (mostly tabletop radios but some portable ones too) that also have a provision for an external antenna for a more robust mechanism of receiving the signals. We strongly recommend units that provide an external jack for antennas simply because they can pick up signals even in remote places as well as high rise buildings or apartments. In all such situations, the built-in antennas will fare poorly. A shortwave radio can be a great entertainment device, a tool to stay in touch with the world, and even as an emergency device to get in touch with the authorities in tricky situations. All the devices in our top five lineup are great radios on their own but our top pick to recommend as the best shortwave radio has to be the Kaito KA500GRN. The Kaito KA500GRN has the most unique features you can find in similarly placed radios and yet, is so aggressively priced that, to us, it is a no-brainer to pick this one over others. It can be a life saver in emergency situations and yet give you the most satisfying experience even when used as a regular radio due to its excellent reception, display, durable build, and self-charging capability. We hope this article helps you make an informed choice in buying the best shortwave radio.